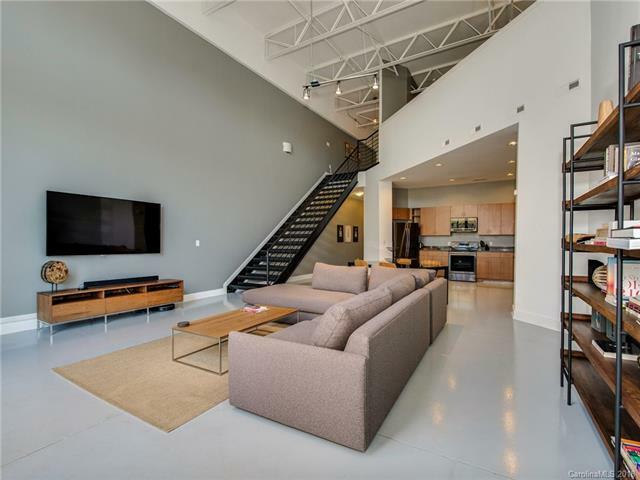 Modern spacious loft convenient to Bank of America Stadium! This updated loft is ready for entertaining and football season! Newly finished concrete floors, plenty of cabinet space, SS appliances, electronic windows leading to patio wired for electronic shades, back patio with separate entrance, upstairs master with loft, large walk in closet, & large master bathroom. Main level 2nd bedroom with hall bath. Secured building access. Walking distance to bars, restaurants & breweries! Conveniently located near 77.